There are unlimited options of reusable bottles available to fit all types of lifestyles; everything from collapsible bottles to flat, paper-shaped bottles to fit perfectly your homework binder to customized bottles with your name on them. They are all unique in their own ways and depends on your personal preference. Glass is 100% recyclable. 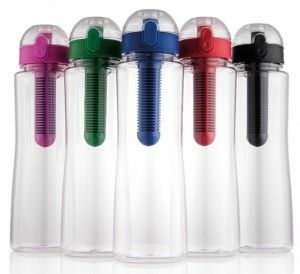 The silicone sleeve protects the glass from shattering making GLASStic one of the most shatterproof reusable bottles on the market. The double wall construction will help keep your drink cooler than single-walled bottles. These bottles are stylish and attractive and come in various colors and designs. And of course, it is dishwasher safe! With the FIT (filter isolation technology) bottle, you can filter your water as you fill. The FIT bottle is the only patented filtering water bottle that allows use of a drink additive and removes chlorine, bad taste and odors and VOC’s. Its wide-mouth, hinged cap allows for a free flowing gulp without the sucking on filter straws! FIT Top is compatible with many of the common and popular water bottles on the market today such as Nalgene 1L, Nalgene SS, Nalgene OTG, CamelBak, Guyot, Cyclone, Hydro Flask, Specialized, Polar Ice, Outdoor Recreation, and many others! Resembling the shape of a piece of paper, the Memo Bottle is a slimline, premium designed, BPA free, reusable and dishwasher friendly water bottle which suitably slides into your favorite carry bag along side your computer, books and valuables. It stands up unassisted and is leak proof. why are all but one of these bottles made of plastic?…isn’t that what you are trying to change? or is it just single-use bottles you’re worried about? plastic is still plastic no matter what shape it’s in, or whether is has been “recycled”.